Do you know what body balm is? I was busy and I didn’t do much posting these days Maybe it can be because I’m lazy. The stress from this is great. I have never pretended to be diligent, but people tough me a diligent person. I was lazy these days, but I had a nosebleed during a class. There were some moments I wanted to have a nosebleed in high school. I had no nosebleed at every time. As my nose bled, it felt like I was living very diligently. I have a photographing today. So I determined to do a posting beforehand. It won’t be bad… It would be better if I started this earlier. As I mentioned at last posting, I am addicted to a massage. So… I found these two products after adding moisture by using rich body lotions. I found a this new product while walking alone a department store. I grabbed it right after seeing the word ‘deep comfort’. What on earth is Murumuru butter? I reads it contains Murumuru butter. It is known to be in Amazon. But I guess they might have been cheating the existence of a ingredient. The reason I talk like this is that Murumuru butter doesn’t seem to be very nice for moisturizing skin. It has no scent so it doesn’t give me a pleasure during taking bath. It’s last April, so I can’t remember very well, except the fact that it moisturizes poorly. The amount is also not enough. I used it up for one month, though I didn’t use it much. The biggest reason I don’t feel to use body balm is that I can’t use it with pumping. It is too big to use as a makeup tool. It’s good for ladle body balm, as it’s made of stainless. It’s flat so it enables a clean use. But, I don’t like it. I don’t like using spatula or using my hands. The reason I bought a body balm is that itching was driving me crazy. There’s nothing more to mention about this one. It’s not lght and not moist. I’m afraid of scratching causing me an atopic skin. There also are balm-typed body butter and body lotion in Clinique Deep Comfort. As the butter one is like this, it’s needless to check lotion. I used Clinique one first, and I bought this one in winter. It didn’t feel good as it’s balm-typed, but I was feeling too dry at that time. I was surprised when I actually feel it with my palm. It doesn’t seem much like whipping cream with eyes. It’s a inexperienced formula that feels soft and more elastic. It feels like a bubble of real whipping cream. It applies well like a bubble evaporates. Anyway, balm is balm. Applying over a little moist skin is good for moisture. What I liked most was the scent. The sweet scent may cause definite likes and dislikes. It’s not like flower scent which we can buy at stores. Applying it after taking bath made me feel good. I didn’t expect light feeling, but when I lied on bed after applying it, it felt little heavy on my skin. But anyway, the itch is gone! So I loved using it. Just, it’s not moist all day like Kiehl’s says. It just prevents dryness removing itch. It doesn’t give moist all over the body! I love this one, but I can’t accept using spatula or spoon when applying it. Honestly, pumping container is usable for this formula. 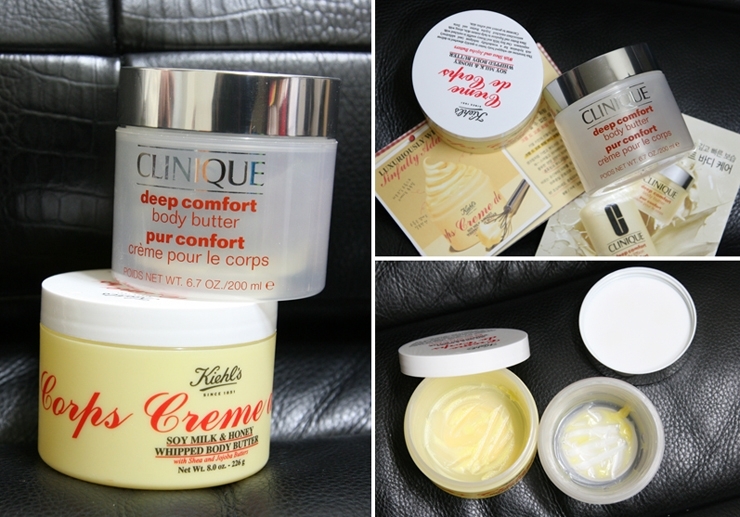 I think Kiehl’s selected this container in order to make a difference from the original Crème de Corps. I’m even thinking of moving this to a pumping container. I won’t use it any more. I liked the moisturizing effect, but I don’t like the scent. It is not worth considering for me. The original Crème de Corps was felt like a melted plastic, but this sweet Crème de Corps Whipping is like honey butter. One who liked the feeling might like this one. Please check the scent beforehand! As I got older, I came to prefer products that are rich and have great moisturizing effects to ones that are matt and moisturize less. I will announce winners of last Honey Party. I appreciate all neighbors who registered with interest. However, as many of my friends offered me some samples for Honey party… I feel great that many people are attracted to this. I wanted to introduce a cheap and great restaurant. It’s Won Mee Jung in Itaewon. It is said to have 20 years of history. I am not sure it feels like the history, it’s quite shabby compared to these restaurants. Well, it’s not sure but sometimes I have meal in here, I find groups of gangsters. My head sink forward on my chest and chew beefs not to make eye contact with them. They are not just teenager bullies…they are original gangsters famous in their territory. Yes… those gangsters also had a great taste. I just took only one picture of each and I put my cell away. I came here for the first time after looking nice place to have a doenjang stew. Doenjang stew costs 5500 won… it’s so tasty. Pork stew costs 6000 won. It’s like pork kimchi stew. You might feel deep taste. It’s the taste of countryside. I don’t like hand-rub beef. I have a bad experience with it when I was young. I will save this story for next time. They let me try the hand-rub beef so I closed my eyes and decided to put it in my mouth….and I feel heaven. I don’t prefer sweet taste…But it is fitly sweet. Most of all I like the grill. One thing is that… smoke doesn’t go away. Then think of gangsters sitting next to you. I decided to stand it for its taste. Even gangsters don’t complain about it. Hangover soup costs 3000 won. It’s real cheap, isn’t it? Stews are all in good price. It’s cheap like my clothes…but I was shocked by the total cost. The beef wasn’t cheap.. It cost over hundreds of thousands won as there were 3 adults. I usually go Hyatt Hotel for desert after having a meal at Won Mee Jung. It’s better than I thought but everybody seems to smell me. However, we cannot just go through Hyatt’s historic blueberry cheese cake. In fact, I’m totally full, but it feels like forgiving my race when I pass through here. 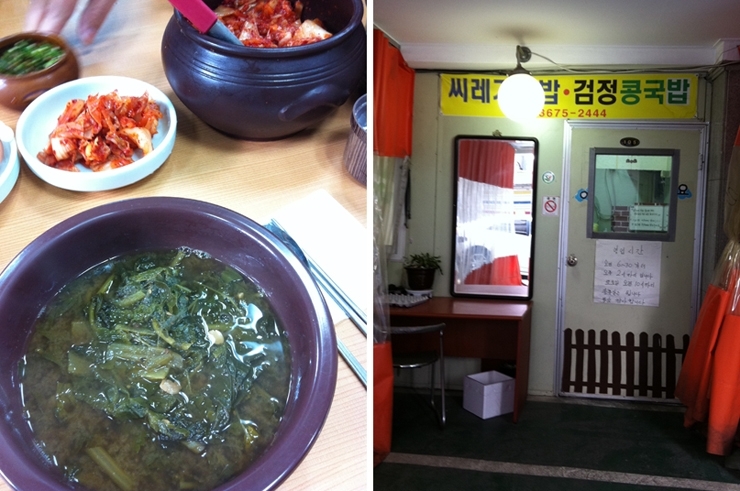 Dried radish greens stew only costs 3000 won. It is hard to have change after paying 10000 won for meals for 3 people. I know routes in Jongro… but it is quite hard to find. They sell dried radish greens stew with rice. It contains rich mineral, vitamin, and fiber! You don’t have to rely only on my taste. People of every age group love this. They say Songhae and foreign Korean representative love this place. What a surprising power this 3000 won stew have! This place is also super shabby. Like Won Mee Jung, I wasn’t able to take pictures freely. You can view a lot of pictures through Naver. Just, it can be hard for people with luxurious taste to digest. It was fine for me though I have a weak stomach. 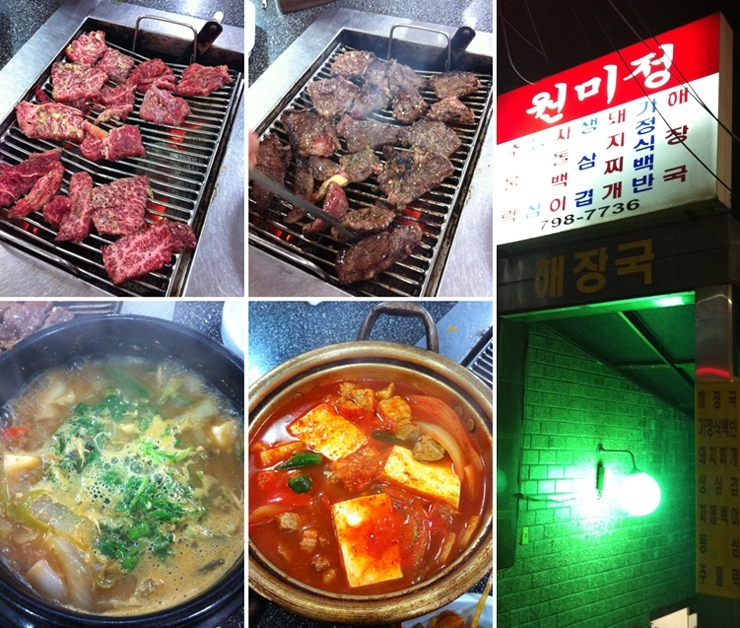 They serve boiled chili and boiled egg, and kimchi. It’s totally fine to add chili on your soup. Too much chili can ruin the stew! People crush it and put it on stew, but I can’t. Side dish is only kimchi! Not only the soup itself, but the soft texture that cannot be felt when eating bone stew is so impressive. It’s hard to find this place…how can we make it on time…? Last Saturday…I was 30 minutes late, but I could have it as my company was patron. I might have it if they sell it 4~5000 won in Chungdamdong. The original gangsters I commented before come to have this historic srew! My friend said that the government is near so I deleted right ahead. I never have seen former and once the latter.